It’s an understatement to say that tarot is all the rage right now. What started as a card game in 13th century Italy has become a household staple for any magick-minded millennial who’s looking to explore their own personal universe — with a bit of help, of course. By working with the cards in a tarot deck, you discover truths about yourself, and connect to your intuition and unconscious while you’re at it. Though tarot will allow you to explore your heart’s deepest desires, it’s also a valuable tool to help you dive into the depths of your shadows. We tend to shy away from learning about the difficult parts of ourselves, the parts that are “too much,” “too bitchy, “too jealous and insecure,” or whatever. But just as the moon waxes and wanes, so do we. In the dark of the moon, it’s the perfect time to learn about your shadow side, and that is why Wren McMurdo created the Dark Days tarot. We talked to Wren about working intuitively with the tarot, her inspiration behind creating the Dark Days deck, and also asked about what her advice would be to all those newbie tarot readers out there. 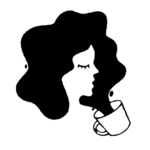 HelloGiggles: What inspired you to start this deck? 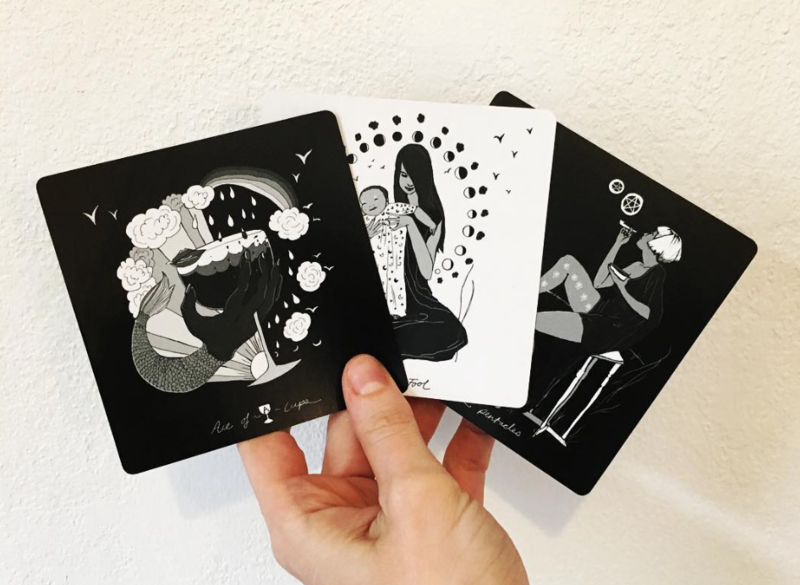 Wren McMurdo: Dark Days Tarot is inspired by the moon, especially the dark days of the lunar cycle, when there is a deep pull to restore and reflect. As a Cancer sun sign and femme witch, my life is particularly ruled by the moon. And as someone who has struggled with depression and anxiety like most of us, I appreciate that there is space to steadily expand and contract in the lunar cycle, so that I never have to feel stuck in a certain way of being. In this world that’s moving so quickly, it’s helpful to have permission from the moon to ebb and flow. It’s also helpful to have permission to have days when truth feels unknown and emotions run deep. Dark Days Tarot cards can offer a safe metaphysical space to be authentic, holding readers and any secrets safe, while referencing the inevitable and comforting pull of lunar time. HG: How did you begin your journey with tarot? WM: My first tarot reading occurred with a dear friend who lived in an old haunted house that I and eight other single queers shared in our early twenties. It was a nearly-condemned and rickety mini-manor in the heart of Seattle’s Central District, and we had a ghost who could be heard washing dishes, clomping behind us in the hallway, and opening the stuck window in the attic. We asked my friend’s tarot cards, and they guided our imaginations to discover secrets about the property, and the person who died there, that we later confirmed with public records. It was amazing how the cards had awakened our intuition so strongly. Then again, perhaps it was our friend communicating via the cards! Probably both. HG: How has working on this deck changed your relationship with the cards? WM: I’m “fluent” as a card reader now. I know these cards like I know my own body; I read them easily and naturally. I do not need a guidebook, even though I adore referencing the guidebook for Dark Days, written by my gorgeous and wildly magical friend, poet and writer Emily Mundy. Her writing is the sensitive connective tissue of this project. It is brimming and mystical. My intuition plays a much larger role in my life thanks to studying the cards, and my confidence has received a significant boost. I trust myself more easily. I also find that I can read things other than cards. The other day I “read” the grout in my bathroom tub. It’s all been very rewarding. HG: What was the most difficult part of this process? WM: Illustrating the deck was easy. It was fun and offered so much in the way of intuitive development. The production part, and facing the reality of the finished product, was harder. It required every bit of bravery I had within me to hand the deck over to a printing company. It was difficult waiting for the finished decks to arrive, and then nerve-wracking to unwrap them to see if they were “perfect” or not. I actually saw tiny errors as huge flaws and could barely look at them for a couple of days after several boxes of them first arrived. Then I fell in love. Interestingly, it took some letting go to look at the beauty I’d manifested. HG: What’s your advice to someone just beginning their tarot journey? WM: I’d suggest a tarot newbie focus on finding a deck that makes them feel really good and excited. It should feel inspiring to look at and interpret the images. Also, don’t feel pressured to know what the cards “mean” by heart, necessarily. There are guidebooks for that, like the Dark Days Tarot Guidebook that comes with each deck. I consider the intended meanings of tarot cards prompts to think independently. The goal is to become more self-aware. What do you see? What is the first thing coming to mind? What does the image and/or its description prompt you to think about? HG: Do you have a favorite spread you like to use with the cards? WM: I’m usually happy with a simple three-card-cut, which is just three cards laid out in a horizontal row. Sometimes I label them as past, present, future if I’m practicing time-based divination. If I’m simply inquiring into a particular topic, the cards don’t need those metaphors. If I don’t feel quite connected to my truth after this initial spread, I’ll apply two cards to any individual card to explore more deeply. Sometimes the spread starts looking like a tree or roots, growing towards me and deeper into the inquiry at hand. I like this simple approach with layering capabilities best. HG: How does the idea of the “shadow” self play into this deck, if at all? WM: Shadow is darkness cast, and this deck is all about honoring lunar darkness as restorative and healing. It’s important to look at the “shadow self” in order to repair breakdowns in integrity, that which makes life “work.” In darkness, there is an opportunity to become more awake and aware of oneself. It is our responsibility to become aware on many levels, for our selves and our world. You can buy the Dark Days tarot deck here.